Updated 10 May; updates in blue. 1901. The exiled, penniless king of the tiny Eastern European country of Maurevania assumes the name Hamilton Cleek and begins a decades-long run of high-profile, very clever thefts. (Thomas Hanshew's Hamilton Cleek stories, beginning in 1901). Harry Houdini returns from Europe a star. While much of his life over the next twenty-five years will be focused on his stage performances, on more than one occasion Houdini follows the lead of adventurers like Nick Carter and fights and defeats evil-doers. (Auf den Spuren Houdinis, 1916). (see also 1913 below). Houdini may have been associated with the “Celluloid Adventurers;” see Note #6. The French Foreign Legion is ordered to pacify the Berber tribes of the Riff Mountains in Morocco--a difficult assignment, since the Riffs (as they are called) are both brave and persistent and hate the French. One of the Legionnaires is Pierre Birabeau, the son of a general in the Legion. Both Pierre's father and the other Legionnaires see Birabeau as a bungler and a coward, driven mad or stupid by the blow of a venal general. Birabeau had tried to stop the French's campaign of terror in Morocco and as a consequence was beaten for his troubles. However, Birabeau's bungling and cowardice is only an act meant to deceive the French. In reality Pierre is the dreaded Red Shadow, a masked marauder who leads the Riffs against the French. Birabeau hates "the cruelty that was disgracing France" and has vowed to free the Moroccans from the French. The Shadow is a friend to the poor as well as to his band of Riffs; the people of Morocco would rather die than betray the Shadow. As for the Riffs, they, too, would rather die than let the Shadow come to harm; like him, they "have sworn that when the law is wrong, we will right it, by force." Most of the Riffs believe the Shadow is a Muslim Riff, like them, but Sid el-Kar, the Shadow's lieutenant among the Riffs, knows the Shadow's real identity. (Sigmund Romberg's The Desert Song, 1926). 1902. Mac Milford, a Scottish astronomer, scientist, and inventor, has a great desire to be the first man to set foot on the moon. Unaware of the 1900 trip to the moon by Professor Cavor, Milford creates three separate methods for space travel and uses one of them, an anti-gravity force, to travel to the moon. Unfortunately, he is beaten there by an American, "Lowell." Milford follows Lowell to the moon and discover that Lowell has discovered a race of Selenites on the moon and conquered them. Milford eventually escapes from the moon and returns to Earth. (Oskar Hoffmann's Mac Milfords Reisen im Universum, 1902-1903, and H.G. Wells' The First Men in the Moon, 1900-1901). 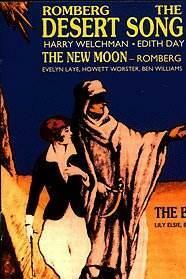 As Dr. Lofficier has noted, the Moon was virtually deserted by the beginning of the 20th century. The Selenites who confronted and captured Professor Cavor apparently had great numbers as well as advanced technology and seemed to have designs upon the Earth, but this was clearly a bluff. Lowell's conquest of the Selenites only two years after Cavor's arrival gives some hint at weak the the Selenites had become. Undoubtedly a major reason for the Selenites' weakness was the Vernon Julian-designed diseases bioengineered to destroy the Selenite race. (For more information on this, consult Drs. Coogan and Powers' article on Vernon Julian). The Selenites would eventually recover, however, and in the 1950s would launch an unsuccessful attack on the Earth. (Léopold Massiera's "L'Énigme des Soucoupes Volantes," 1953). The English master thief George Edgar Pipe begins scommitting crimes in England and Europe. (Arnould Galopin's Edgar Pipe novels, beginning with Mémoires d’un cambrioleur retiré des affaires, 1922). Pipe has certain similarities with Arsène Lupin, but as far as is known the pair never met. 1903. Lieutenant Eigil Holst begins a successful career as an officer on the Copenhagen police force. He is a methodical and intelligent (if not brilliant) policeman. (Baron Palle Rosenkrantz's Hvad Skovsøen Gemte, 1903). Theophrast Longuet, a retired merchant, finds himself possessed by the spirit of Louis-Dominique Bourguignon, a.k.a. Cartouche. (see 1710-1721). Longuest, as Cartouche, has various adventures and discovers a secret society which had been living underground, in enormous caverns beneath Paris, since the 14th century. Cartouche is not a hero, however, but a villain, and tries to commit more crimes in the modern era. The secret society, for their part, are mutants, with ears like horns but no eyes; they are the "Talfa," and they live in a communist paradise, not possessing any code of morals but by reason of their even temperament not needing laws or police. Longuet eventually shakes off the possession and escapes from the Talfa. (Gaston Leroux's La Double Vie de Theophraste Longuet, 1903). Edmond Pezon begins a years-long series of escapades around the world. Edmond is the grandson of the famous Baptiste Pezon, founder of La Ménagerie Pezon, and Edmond takes after his grandfather both in his skill at lion-taming as well as his bravery. But Edmond has even more drive than his grandfather, and travels around the world, from Africa to South America to Asia, tracking and trapping animals in every environment, and helping innocent men and women and defeating wicked oppressors while doing so. (La Vie d'Aventures et de Chasse du Dompteur Edmond Pezon #1-25, 1909). As with several other people, including Hans Stosch-Sarrasini (see c. 1890-1934) and Harry Piel (see 1921-1930, below), the true details of Pezon's life were often omitted from most press accounts or were obscured by his work with the Pezon circus. Edmond Pezon was far more active than history has recorded, and possibly for years after his supposed death date of 1916. As well, it is interesting that so much of Pezon's activities around the world, especially his battles on behalf of those who were too weak or outnumbered to fight for themselves, were similar to Stosch-Sarrasini's and followed his. A reasonable conclusion is that Stosch-Sarrasini had some part in directing Pezon's actions, as Stosch-Sarrasini did with Piel and the other "Celluloid Adventurers" (see Note #7 below). 1904-1905. Eugene Valmont, a former Chief Detective to the French government, investigates a number of cases, meeting with only very limited success. (Robert Barr's Eugene Valmont stories, 1904-1905). 1904-1906. Atalanta, a brave and beautiful German adventuress and explorer travels around the world, defeating pirates, freeing white slaves, visiting Lemuria, defending the innocent and punishing the wicked. (Robert Kraft's Atalanta #1-60 and Atalanta, La Femme Enigmatique #1-80, 1912-1913). A German detective working under the (obvious) pseudonym Detective Nobody solves a variety of crimes in Europe, some verging on the fantastic. He uncovers a criminal "rejuvenation treatment," visits Devil's Island, captures a Cossack murderer, and travels to Mexico on a particularly unusual case. 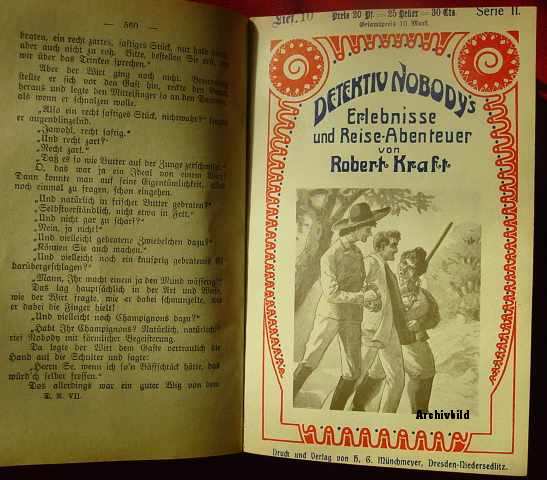 (Robert Kraft's Detektiv Nobody's Erlebnisse und Reiseabenteuer #1-12, 1904-1906). 1904-1928. For over two decades Asbjørn Krag is one of Denmark's most successful detectives. In his younger years he is a policeman, but he soon leaves the forces to become a consulting detective. Due to his intellect and experience as a policeman, he is well-respected by the police in both Copenhagen and across the country. Assisted by Thomas Ryer, a younger newspaper reporter, Krag solves a wide range of very difficult and puzzling crimes. He has "hypnotizing" and is capable of being "diabolical," both in terms of his cunning and in his sheer force of personality. By the mid-1920s Krag had retired from active service, and in 1928 Krag's biographer, Sven Elvestad, notified the Copenhagen and Oslo newspapers that Krag had passed away. ("Stein Riverton"/Sven Elvestad's Asbjørn Krag stories, beginning in 1904). There is no evidence that Krag and Lt. Eigil Holst ever met. However, Krag did eventually meet one of his mentors in detection (see 1906 below). 1904. The world learns of the horrors of Eucrasia, the Pacific island base of Doctor Armand Caresco. Caresco applies his theories and methods of vivisection to the inhabitants of Eucrasia, altering them to better do their jobs. The captain of the plane which brings outsiders to Eucrasia is a limbless trunk with telescopic vision. Even the island itself is in the shape of a human body. The natives of Eucrasia are addicted to various sensual pleasures and generally submit to Caresco’s rule, for fear that he will castrate them or worse. On Eucrasia Caresco makes use of “omnium,” a mysterious and unexplained power source, to create scientific prodigies: a machine capable of stripping the years from human bodies and reversing the aging process, a fast underground train system, food pills, omnium-powered diving suits, and so on. But Caresco is insane as well as brilliant, and is given to such things as collecting the spleens of all those he operates on. Eventually Caresco dies and Eucrasia is destroyed in a volcanic explosion. (André Couvreur's Caresco Surhomme, 1904). A Danish private detective, Madame d'Ora, travels to America in pursuit of a criminal. It is d'Ora's first trip to the United States and she is dazzled by what she sees as the glorious technology of the new land, from trains to plains to automobiles. (Johannes V. Jensen's Madame d'Ora, 1904). c. 1905-c. 1915. Nick Carter fights a lengthy duel with the French crimelord and arsonist “French Jimmy” Lebeau. (The Nick Carter stories). 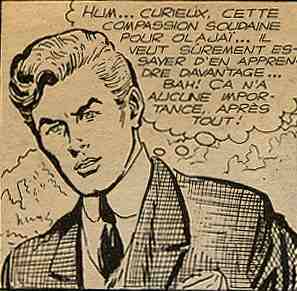 Nick Carter is plagued for several years by the French adventuress “Baroness Latour,” a.k.a. Mademoiselle Valeria. In her yacht Idaline she indulges in kidnaping, murder, and other crimes, becoming wanted around the world. With the use of paraffin injections she regularly changes her looks. (The Nick Carter stories). 1905. A German adventurer who has spent the past several years in India has a series of fantastic adventures in the "country of miracles." (Around the Indian Imperial Crown #1-10, 1905). At the end of the year the adventurer leaves the subcontinent, having learned everything he could from the various Buddhist masters of India and Tibet. The infamous French gentleman thief Arsène Lupin--the greatest of the kind--begins his decades-long flouting of the law. (Maurice Leblanc's Arsène Lupin stories, beginning with “L'Arrestation d'Arsène Lupin,” 1905). A French inventor, Doctor Omega, travels to Mars. (For more information on Doctor Omega's exploits, please consult Dr. Lofficier's article on Dr. Omega). (Arnould Galopin's Le Docteur Oméga - Aventures Fantastiques de Trois Français dans la Planète Mars, 1905). 1906-1910. The German adventurer who defeated various evils in India in 1905 (see above) reappears in Rome and sets himself up as a consulting detective. Going by the name Sir Ralf Clifford, he puts the superhuman abilities he gained from the fakirs of the East, including the ability to cloud men's minds so that they cannot see him, to good use in defeating evils both mundane and supernatural, both in Italy and across Europe and Asia. He defeats secret cults, vampires, subterranean masterminds, werewolves, and living Buddhas. He uncovers secrets in Lhasa temples, defeats the "Black Priest of Notre Dame," travels to the South Pacific and Mexico, and recovers the stolen pearls of an Indian Maharajah. Despite being a “Great Detective Syndrome” sufferer, Clifford is fully functional and never resorts to taking on the name of Sherlock Holmes; he contents himself with merely imitating Holmes' manner and methods. (Sir Ralf Clifford, l'Uomo Invisibile, 1906-1910, and Sir Ralf Clifford, Der unsichtbare Mensch oder Das geheimnisvolle Vermächtnis des Fakirs #1-192, 1921-1925). As described elsewhere, the fakirs Clifford studied under in India were in the employ of the organization led by the mysterious "Mr. Am." Their goal was to foil the evil schemes of the sinister "Nine Unknown," who were themselves empowering a variety of individuals, including Mefisto, the enemy of Tex Willer (see 1865-1890). It has been noted by several scholars that the power of "invisibility" which Clifford displayed was remarkably similar to that used in the 1930s by the mysterious vigilante known only as The Shadow. There is no conclusive proof that the fakirs who taught Clifford were from Shambala, but the circumstantial evidence argues for it. Lucifer Box, an English artist, aesthete, and assassin on behalf of British Intelligence, foils a conspiracy to force the volcanoes of Europe, including Mt. Vesuvius, to erupt. 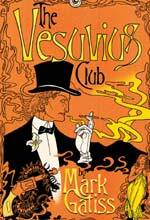 (Mark Gatiss’ The Vesuvius Club, 1997). An insane German scientist, Dr. Flax, abducts thirty-one six-year-olds from Paris. Flax and his accomplice and lover, the Comtesse d'Houdotte, take the children to Flax's mountainside fortress in Fruitt, Switzerland, and experiments on the children. Flax injects each child with "Flaxium," a special extract of radium of Flax's own creation. The children become geniuses and create advanced technology and weapons for Flax, but a European coalition of troops (and the egos of Flax's superchildren) foil Flax's plans. Flax and the Comtesse commit suicide. (Louis Forest's On Vole des Enfants a Paris, 1906). Sherlock Holmes fights Dr. Mors, "a proper Professor Moriarty." (Ferdinand Bonn's A Stolen Legacy, 1906). Later that year Sherlock Holmes and Dr. Watson travel to Norway, where they assist Asbjørn Krag and Thomas Ryer in the resolution of a criminal case. (Bjarne Nielsen's Den Røde Lygte, 1991). 1907. The Parisian teenage detective "Toto Fouinard" begins a successful run of crimesolving. He is insouciant and philosophical; he was raised on the streets but worked his way up from poverty and became an actor, with detection being a sidelight. He does not carry a gun, but is good with his fists and even better with "Justine," his cane, who he calls his "most faithful collaborator." His enemies are on the crazed side: insane scholars, mass murderers, ferocious gang members, Hindu fanatics, and scientist poisoners. (Jules Lermina's La Vie D'Aventures, 1907-1908, and Toto Fouinard, le petit detective parisien, 1908-1909. An Italian detective, Kutt Hardy, opens a consulting agency in Rome. He is is a “Great Detective Syndrome” sufferer, but his version of the mental disorder manifests itself in a conviction that he is a better detective than Sherlock Holmes. Hardy insists that he uses a more logical crimesolving method and that Holmes "talks too much and deduces too little." (Herbert Bennet's L’opera di Vaini, 1907). A French woman known as Miss Mousqueterr defeats a secret Hindu cult. (Paul d'Ivoi's Miss Mousqueterr, 1907). Joseph Rouletabille, a handsome young reporter, begins a long and successful career as an investigative reporter, do-gooder, detective and adventurer. Dr. Lofficier has charted his remarkable career, which included an encounter with Erik, the so-called "Phantom of the Opera." (Gaston Leroux's Le Mystère de la Chambre Jaune, 1907). Dr. Cordat, a brilliant young surgeon, makes contact with Spiridon, an intelligent ant, roughly the size of a man, who is the ruler of a colony of sentient ants who live on an island off the coast of Corsica. Cordat and Spiridon have a series of conversations in which Spiridon reveals himself to be both brilliant and curious about human civilisation. Spiridon ends up going to Paris with Dr. Cordat. In Paris Spiridon, disguised as a human, becomes a famous doctor, using his genius and his advanced knowledge to cure even supposedly uncurable diseases. Unfortunately, jealous competitors unmask Spiridon, who is forced to kill others to protect himself. One thing leads to another, he's wounded, he's put on the operating table, and he loses his advanced intelligence. (André Laurie's Spiridon le Muet, 1907). This would not be the last time that giant, intelligent ants would be encountered. It is at least somewhat publically known that the flora and fauna of the world are more unusual and even fantastic than children are generally taught. The effect of the Wold Newton meteorite on canines has been well documented, and there are numerous documented examples of explorers discovering extraordinary examples of animals and plants, from the giant ape of Skull Island to the bizarre range of creatures to be found in the lands beneath the surface of the Earth. In the mid-1950s abnormally huge, intelligent, and hostile ants would be encountered in Los Angeles. (Yates and Hughes' Them, 1954). It is probable that the Corsican and Californian ants came not just from different colonies but were in fact different species altogether, but it is possible that the two different groups are not only the same species but are also from the same colony, and that the caverns and tunnels and countries beneath the Earth's surface are the home to a supercolony of intelligent ants. If this is the case, an expedition to wipe out the vermin would seem to be called for. 1908. Ethel Boston, an adventurous and brave young American woman, is called upon to solve the murder of "Sherlock Holmes." She does, and is inspired enough by her success to carry on investigating crimes. She becomes a very successful private detective, "Miss Boston," putting her wits and skill with guns to good use and helping a number of innocents. 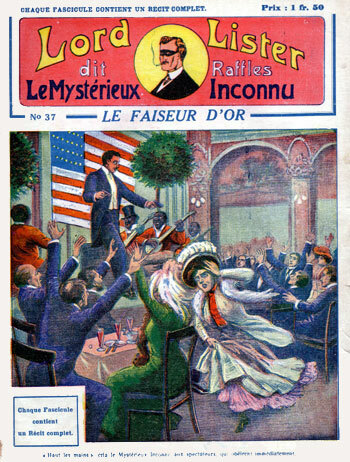 (Miss Boston, la seule détective-femme du monde entier #1-20, 1908-1909). It is of course obvious that the real Sherlock Holmes was not killed in 1908. The sad truth is that the victim was one of the sufferers of the “Great Detective Syndrome:" Gapy Bermudez, cut down by men who thought he was the true Holmes and were fooled by his imposture and claim that he was the real Holmes. This would not be the last time that Miss Boston was called upon to solve the murder of a celebrated detective: see 1909 below. Gil Dax, a French inventor-aviator, has a series of adventures in the skies above Europe and Asia. Using his advanced aircraft, he fights German spies, an Indian maharajah, and various insane scientists. (Jules Hoche's Gil Dax, Empereur des Airs #1-20, 1908). Dicky, the teenaged Parisian "king of the reporters," travels on a superpowered dirigible. (Louis Boussenard's Les Gratteurs de Ciel, 1908). A “Great Detective Syndrome” sufferer, Albert Fleischmann, begins work as a consulting detective in Rome. He bills himself, far too confidently, as "the rival to Sherlock Holmes." (Mark Turner's Albert Fleischmann stories). A “Great Detective Syndrome” sufferer known as "Detective Frank" begins work as a consulting detective in Berlin. (Matthias Blank's Erlebnisse des Detektiv Frank, 1908, and O.E. 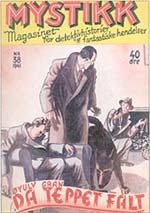 Ehrenfreund's Erlebnisse des Detektiv Frank #1-5, 1910). Knut Gribb begins a very long and very successful career as a policeman in Norway. He works his way up from policeman to Chief Inspector to Superintendent of the Oslo Police Department and gains a reputation across Scandinavia for ingenuity and moral rectitude. (Sven Elvestad's Knut Gribb stories, beginning in 1908). Doctor Lerne, a crazed French scientist, carries out a series of organ transplants, both between men and animals and even plants and machines. (Maurice Renard's Le Docteur Lerne - Sous-Dieu, 1908). The French adventurer Serge Myrandhal creates a psychic energy-powered spaceship, the Velox, in an attempt to go to Mars. The Velox is stolen, so Myrandhal creates a second ship, the Annabella, and uses that to go to Mars. Myrandhal is assisted in this by the psychic power of the fakirs of the Rajah of Almowrat. 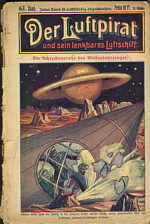 (Henri Gayar's Les Aventures Merveilleuses de Serge Myrandhal sur la Planète Mars, 1908). As described elsewhere the Rajah was actually in the employ of the same "Mr. Am" whose agent empowered Ralf Clifford (see above). Martin Numa, a policeman in Paris, comes to the attention of the public due to series of very successful and arrests. (Léon Sazie's L’Œil de la police, 1908). A German engineer/inventor, Captain Mors, begins his long quest for vengeance, first against the evil men who killed his family, and then against those who would oppress the innocent. Using his advanced technology and spaceships he and his crew help the good and combat the wicked, both on Earth and in the planets of the solar system. Mors encounters a variety of different aliens, some hostile and some well-inclined. (Der Luftpirat und sein Lenkbares Luftschiff #1-165, 1908-1911). Mors' background remains a mystery. His encounter with Alaska-Jim (see 1867-1890) is a part of the historical record, and Dr. Lofficier has plausibly speculated that Mors was trained by Arthur Gordon Pym/"Captain Nemo," but beyond that little is known for sure. It is possible that, as stated elsewhere, Mors' technology came in part from the organization of "Mr. Am" (although the chronology of this previous article is in accurate and must be corrected). Given Mors' future actions (see 1911-1920 and 1921-1930 below) some judgments can be drawn about his personality, but his personal history and background will remain, for the most part, unknown. Minx, a tuxedo-clad ghostbreaker and exorcist, gains fame in Germany for his actions in combating the supernatural. Several of his opponents are revealed to be ordinary men shamming the supernatural, but on several occasions Minx takes on more fantastic crimes, including murder via hypnotism, screaming blood, disappearing corpses, and the like. (Minx der Geisterbeschwörer #1-10, 1908). Minx's relationship to Sâr Dubnotal is unknown, nor is it known whether the two ever met. Léo Saint-Clair, better known as the Nyctalope, begins a decades-long war against evil across the Earth. (Please see Dr. Lofficier's extensive dossier on the Nyctalope for more information). (Jean de La Hire's L'Homme Qui Peut Vivre dans l'Eau, 1908). A tuxedo-wearing gentleman thief, seemingly modeling himself on Arsène Lupin, begins successfully stealing from the rich and famous and blooded nobility of Europe, particularly Germany and Russia. The thief, Prince Petroff, steals a great deal of money and valuables, but also does some good deeds, taking on the Black Hand in Italy and capturing an insane locomotive engineer. (Robert Heymann's Fürst Petroff, der König der Hochstapler #1-10, 1908). There is no evidence that Petroff ever came into conflict with noted railway detective Godfrey Page, although Petroff's crimes are exactly the sort which Page would have investigated. (Victor L. Whitechurch's Godfrey Page stories, beginning in 1903). Nat Pinkerton jousts with Inez Navarro, one of Nick Carter's most dangerous opponents, in Russia. (Nat Pinkerton stories). Rolf Rodewald, a German adventurer and explorer, has a series of adventures in different parts of the world. Many of his adventures are on the American frontier, fighting against various evil Native Americans, but at other times he goes to Hawaii, the Amazon, Peru (to fight the last of the Incas), and New Guinea, among other locales. (Adrian Mohr's Rolf Rodewalds Reise um den Erdball #1-50, 1908-1909). 1909. At different times during the year the terrorist Evno Azef fights both the Sexton Blake and mystic Sâr Dubnotal (see below). (issues of Union Jack and Sâr Dubnotal, 1909). Although the historical records of Azef's life omit these clashes, the biographers of both Blake and Dubnotal include them. In an uncanny repeat of her first case, Miss Boston is called upon to solve the murder of a "celebrated detective:" "Nick Carter." The murder victim was clearly not Nick Carter, as he continued to be active in the United States for many years after this. The identification of the murder victim as "Nick Carter" was clearly an attempt by Miss Boston's biographer to heighten interest in her activities and, possibly, to protect the identity of the victim. However, most likely due to a communication error between Miss Boston's biographer and the artist for the magazine in which Miss Boston's stories appeared, the portrait of the murder victim appeared on the cover of the issue in which the murder of "Nick Carter" is described: John Siloch. (Miss Boston, la sola donna detective del mondo #1, 1909). The mystic Sâr Dubnotal begins fighting a variety of crimes in both France and Europe. Dubnotal is the "Conquistador of the Invisible Ones," the "Napoleon of the Immaterial," "Great Psychagogue," the "grand spirit guide," a psychic investigator/occult detective similar to Carnacki, although much more in the Eastern than the Western vein. He also refers to himself as "El Tebib," "the Doctor," to emphasize his learned nature; he is medically trained and is an excellent psychologist. He is also trained in the Lombroso method, and can recognize the criminal "type" by simply looking at them. However, Dubnotal (a Rosicrucian) is better known as a master of "psychognosis." He has a wide range of powers, including hypnosis, telepathy, and levitation. He is an expert, and there is "no phenomenon of somnambulism, of telepathy, of `telepsychics,' of levitation, hypnotism, magnetism, suggestion and autosuggestion" beyond him. Dubnotal is "instructed in the school of the brahmins and the most famous Hindu yogis" and has "victories without number over the battle champions of the invisible." He is even capable of speaking to the spirits of the deceased. Dubnotal, who wears a Hindu turban and affects a generally Indian/Hindu air, lives in a spacious apartment in the rooms below his laboratory. He is assisted by a few people, but his best assistant was the delectable Gianetti Annunciata, a "petticoated" medium who combines, in her manner, the "gay working girl" and the "high priestess." Annunciata translates the raps of the invisible world into French, and vice-versa, thus enabling Dubnotal to communicate with the dead. (Annunciata is assisted in this task by a small "spiritual telegraph" machine). 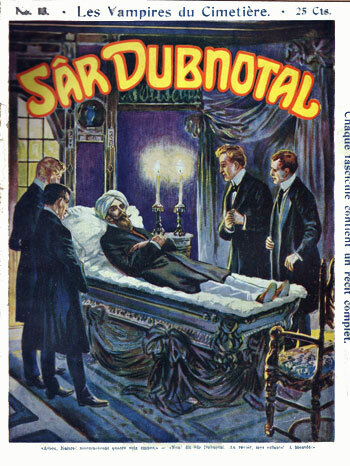 (Norbert Sévestre's Sâr Dubnotal #1-20, 1909-1910). Sâr Dubnotal is a Western man who traveled to the East and was taught secrets by a group of fakirs; as mentioned elsewhere, it is likely that he was taught these abilities by the organization of Mr. Am to fight against the schemes of the Nine Unknown. A nameless man calling himself "King of the Paris Apaches" rises to power in the Parisian underworld. (Der König der Pariser Apachen #1-16, 1910). It might reasonably be speculated that the "King" succeeded the rule of the "Margot, Queen of the Parisian Apaches" who bedevilled Hamilton Cleek (see above) and was in turn replaced (violently, without a doubt) by the fearsome Fantômas (see below). John C. Sinclair, a rich Englishman bored with the life of leisure, adopts the mannerisms and methodology of A.J. Raffles and begins a decades-long, successful, and extremely profitable series of crime under the name of "Lord Lister." He becomes so successful at it, in fact, that in many areas he becomes confused with Raffles himself, both in Europe and around the world. Sinclair is a champion cricket player and popular member of High Society whose best friend (and accomplice in crime) is Charley Brand. Sinclair is engaged to Miss Ellen Patrick-Baxter, the cousin of Inspector Baxter of Scotland Yard, who is assigned to capture Lord Lister. (Matull and Blankensee's Lord Lister stories, beginning in 1909). The confusion between Raffles and Lord Lister undoubtedly irritated the proud Raffles. But there is no record of the two ever having met, and no comment by Raffles about his younger imitator has been passed down. Lister did, however, encounter Nick Carter (see 1922 below). The French detective Gaston Max makes his debut. He is a member of the Paris police but is often called upon by policemen of other countries, especially Scotland Yard. A dapper man with a nearly supernatural ability at disguise, Max repeatedly duels, over the next several years, with agents of Fu Manchu. (Sax Rohmer’s Gaston Max novels and radio plays, beginning with The Yellow Claw, 1915). Joe Petrosino, a native of Italy who had successfully fought the Black Hand/Mafia in New York City for many years as a New York City police detective, returns to Italy to carry the fight to the Mafia on their home ground, a fight which lasts for decades. (Giuseppe Petrosino, il Sherlock Holmes d'Italia, 1909). Petrosino is reported to have been killed in Italy in 1909 by the Mafia, and when word of his murder spreads there is mourning not only in Italy but also in America. However, his death was faked. Nick Carter cooperated in the deception, telling his biographer a story about how he teamed up with Petrosino but that their work together resulted in Petrosino's death. (Nick Carter Weekly #656, 1909). But Petrosino was still active in the 1930s, still healthy and still fighting against the Mafia. (L'Avventuroso, 1930s). Jules Poiret, a French detective living in England, begins a successful run of criminals apprehended. (Frank Howel Evans' Jules Poiret stories, beginning in 1909). Poiret's resemblance to Hercule Poirot is pronounced, but no relationship between them has ever been established. Professor Tornada, a French scientist, approaches his fellow scientists with the claim that he can enlarge microbes. Tornada is laughed at and regarded as a charlatan, so he demonstrates that he could do what he claimed by returning to his laboratory in the forest of Rosny, producing "macrobes," and unleashing them on Paris and its suburbs. This is the first of several evil acts committed by Tornada, and it is not until 1927 that he finally reforms. (André Couvreur's Professor Tornada novels, beginning with Une Invasion de Macrobes, 1909). The cruel Romany (Gypsy) crimelord, Zigomar, begins his reign of terror. He is the leader of a band of Romany thieves who terrorize Paris and environs, but his reach is felt across the Continent and even into England. His organization is named "Z," and its password is "Z is the life! Z is the death!" Zigomar's nemesis is Paulin Broquet, a dedicated Parisan police officer who pursues Zigomar for many issues. Broquet catches and seems to kill Zigomar several times, or so he thinks, but Zigomar always emerges unharmed. (Léon Sazie's Zigomar stories, beginning in 1909). Zigomar even jousts with Nick Carter; see 1911 below. c. 1910-c. 1925. Nick Carter repeatedly jousts with the Arsène Lupin-like French master thief, Gaston Dupont. (The Nick Carter stories). 1910. Allan Dickson, an Australian “Great Detective Syndrome” sufferer, debuts. He quickly becomes famous in Australia for his successful solving of quite difficult cases. (Arnould Galopin's Allan Dickson novels, beginning with La Ténébreuse affaire de Green Park, 1910). (see also 1912). The frightening Fantômas begins his reign of terror in Paris. The "Genius of Evil" becomes the most feared crimelord on the Continent, quickly demonstrating that he is capable of any atrocity. He rules a vast army of street apaches and has spies and hirelings everywhere. He is ruthless, determined, and extremely clever. 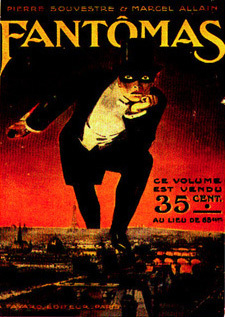 (Souvestre and Allain's Fantômas novels, beginning with Fantômas, 1911). It can be reasonably speculated that Fantômas replaced the so-called "King of the Paris Apaches" (see 1909 above). 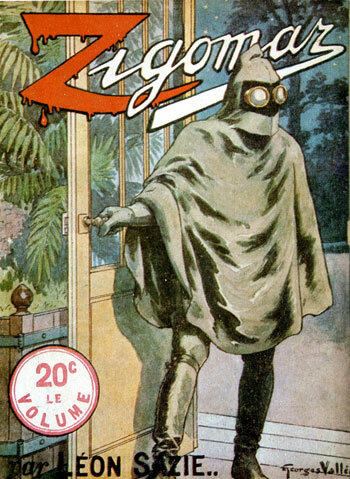 But Fantômas' relationship with Zigomar (see 1909 above) is another matter, one that has never been explored. The two surely did not, could not, co-exist peacefully, but any war or alliance between the two has not been recorded or even hinted at. Inspector Gabriel Hanaud of the Sûreté begins a successful career of solving mysterious and difficult crimes, some of which verge on the fantastic, as in his pursuit of a weretiger. Hanaud can be ruthless toward murderers and evil men but is most often sympathetic. (A.E.W. Mason's Inspector Hanaud novels, beginning with At the Villa Rose, 1910). Nat Pinkerton defeats the Japanese spy Oka-Yuma, who is abroad in America, spying on behalf of the Japanese government. (“Oka-Yuma,” Nat Pinkerton, der König der Detectivs #26, 1910). Eugene Villiod opens a private detective agency in Paris. The crimes he solves which are mentioned in the newspapers are mundane and quite ordinary, but the crimes described in his biography verge on the fantastic. (Mémoires de Villiod, Détective Privé #1-21, 1920). Tip Walter begins work as a consulting detective in Paris. He quickly gains fame, and is described by his biographer as "the equal of Nick Carter, Arsène Lupin and Sherlock Holmes." His cases take him around the Continent and across America and occasionally involve the supernatural and the incredible, as in the case of the "vampire of Carson City." (Marcel Priollet's Tip Walter, le prince des détectives #1-55, 1910-1911). Martin Willéns, a Danish consulting detective who deliberately copies the appearance, mannerisms, and investigative methods of C. Auguste Dupin, begins work in Copenhagen. (Astrid Ehrencron-Kidde's Martin Willéns novels, beginning with Martin Willéns Underlige Hændelser, 1910).